Increase Sword Earth 2 cooldown. Buff 1 skill on staff (they buffed Staff Fire 2 by 10%). Hey @""Arheundel.6451" , what's the next patch going to do? 1. 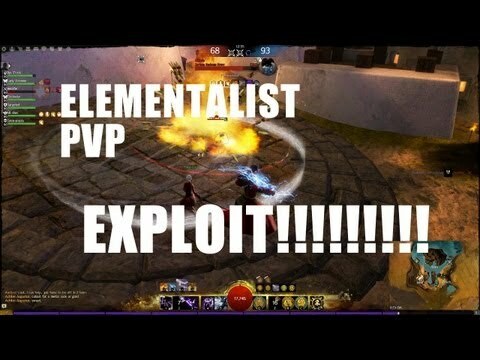 Give elementalist PvP-viable ranged options. 2. Give melee elementalist more gapclosers. Holosmith has a gapcloser on a TWO SECOND COOLDOWN. My personal suggestion is to just make the cooldown on Sword Air 2 (Polaric Leap) about 4 seconds. Basically, everytime I attune to air, I want to be able to gapclose...because that is actually the thought process for attuning to air. You attune to air when you want to go back in on your opponent. Please give elementalist players just ONE rewarding gameplay mechanic? Just one? Can I have fun with just ONE thing? Do I have to have delayed gratification in EVERY aspect of my class? Can I have fun? Where is my Deadeye moment? When do I get to feel strong and confident and cool like Thief/Mesmer/Warrior/Guardian? To be honest i have no reason to play this game as a ele main , ofc i have alt to solving all other problems ele have but its just ... unfun ,like watching your beloved firstborn being a handicap person ,end up in a wheelchair when her little sibling race down the road. Just kidding , but i spend a lot of time making legendaries and fashion war stuff for my ele , just being sad its not really effective as other classes ,its just meh,should i sue the balance team for having trust issue ? cuz they good at disapointed ppl time after time. This is why I created a new and improved elementalist a while back. She now has clones, stealth, more reliable damage, better boons, better cc, and no longer needs to be babysat. It's like she's all grown up now. @Arenanet: Why do you keep balancing the game around PvE? PvE doesn't matter. I beg to differ. It's a PvE game and PvE is what the majority plays. Of course it matters. Its actually what matters most. And in all honesty they are balancing around raids and thats what needs to end. What do you expect them to balance around? Great Jungle Wurm? I dont know, but not what around on a very high end what 20% of the players who play the game are doing, but balancing because of numbers on a golem is not the way to balance a game. PvE doesn't need balanced mechanically. You can give them whatever mechanics you want and change the numbers to fit the desired benchmarks. PvP and WvW need mechanical balance which is far more finicky. Balance for PvP and WvW first, then change the numbers to fit the desired PvE benchmarks. It's actually pretty simple when you think about it like that. Starts with the modes with narrow restrictions, then fit what works in the "narrower" modes into the ones with very wide restrictions. That's what people mean when they say PvE doesn't need balanced. Oh, I agree here - balancing around the golem isn't good. But balance has to be done around the top-tier content by necessity. It is the only place (in PvE) where OP and broken stuff is actually a problem, since it undermines the major point of it - to be challenging. So raid and fractal performance will always be most important considerations when doing PvE balance. Or just change the conditions of the encounter, and players will adapt anyway. Thats how it worked in Fractals, and within weeks people had already solved every problem it threw at them. Even before the meteor shower nerfs and such i thought the encounters as an Ele player in raids where hard..knowing that one hit could down you if you messed up even with your damage was actually good gameplay. But i know what you mean by what you say. This video is from WAAAAY back in 2012. 2012. Saying the exact same thing we've been saying for years. This class has been trash since 2012 and before that. Just delete your elementalist and roll thief. Lmao this man is a god. Get predicted Anet. Don't get me wrong - I don't think the last batch of nerfs were necessary at all. They put ele in a pretty bad spot when it comes to raids and as a result the class saw a heavy decline in use. Ele had highest potential, but like I've said numerous times over, it needs this potential to compensate for all the drawbacks of playing one. It was a pretty decent prediction and he would have been spot on if it wasn't for the new condi cleanse options. That alone makes the balance patch passable for me. That made the patch okay for a minor balance patch. However, the next one has to be better. It's going to be a major balance patch and ele still needs lots of help. The balance team needs to stop with the nerfs alongside the buffs. Even if it ends up being a net buff, it ends up being so minor that elementalist will never catch up. These nerfs should just be put on a list and reserved in case ele actually becomes OP. There is no reason to have preventative nerfs for such a weak class. Best bet is to just give up on Elementalist for PvP. In order to be fixed, the class would need a ground up redesign. Respectfully, what ele needs is not more gap closers, it needs more gap wideners. The single decision that started us down this road to a broken class, was taking a low health, cloth armored glass cannon, and forcing it into melee range for competitive play. Everything that has followed, flowed down from there. Until staff and scepter are viable weapons in PvP, the Elementalist will remain broken. This is actually really insightful and it shows the extent of the stockholm syndrome we have as elementalist players because we're now bargaining from such a weak position that we've decided to accept it as a given that this class should be a melee class in the first place -- and maybe it should? But it's not suited for it right now at all. Well, I don't know what people were doing at PoF launch when Fresh Air S/F Weaver was pretty strong. Perhaps not competitive but the damage was there. Staff needs to split from PvE and have all the changes reverted for one. But still, please, avoid asking them to redesign the class from the ground up. That's asking for trouble. Well, I think I did say you shouldn't accept that ele has to compromise on damage builds to get buffs to support. There should be a healthy spread of both. Don't let raids and Snowcrows golem DPS benchmarks dictate the direction of game balance. I understand your concern, and FWIW I'm not really asking for a redesign. I think it's too far along to be realistic, not to mention that the designers clearly don't agree with me, since Weaver took Elementalist opposite the direction I wanted to see. Raw damage has rarely been the problem with Ele in GW2. Survivability is the issue that has plagued the class since 2012, again because of that melee decision. How do you make a class that has the lowest combined HP/Armor in the game, not be roadkill, when you force it into melee range? Simple: You buff up it's traits and skills to compensate for inherently lower survivability. Doing so has a downstream impact, though. Elementalist has been a feast or famine class since launch; it's either god tier meta faceroll, or it's junk. I've been playing Ele since launch day, and rarely can I recall a time when the class was merely 'OK'. My point is, Elementalist being forced into melee range, and it being a feast or famine class, are two facets of the same problem. When the entire class mechanic is reliant on utility skills and traits for survival, to a greater degree than every other class in the game, it follows that changes to those skills and traits will have a disparate impact on effectiveness. We're largely agreed. It's why I don't really like sword. PvE is fine because it's just NPC trash but in PvP/WvW, it's outperformed by many other specs. To my mind, that's part of the issue with daggers too i.e. successive expansions and elite specs have rendered it obsolete.